We’d been wanting to check out Psycle studios for a while now, having walked past the entrance on the way to the restaurant many times before. We’d been crushing on their ultra cool branding for a while already- so we were a little more than excited to be able to finally take a little Vurger Co. team trip to the Shoreditch studio. The gym itself is suuuuper nice. The light and airy entrance features pink opalescent walls, a cute little juice bar and a spacious communal area. It only gets better from here. The only way we can describe the changing rooms is luxury spa meets futuristic space station. There are complimentary fluffy towels, the shower cubicles are all stocked with the latest snazzy Sachajuan products, and the lockers all come with a handy coded locking system so you don’t have to worry about purchasing a padlock. It’s worth mentioning that Psycle are doing an awesome workout clothing collaboration with one of our favourite brands LuluLemon at the moment. You can check these out on display in the communal area. What’s so awesome about this studio is the efforts its making to reduce its negative impact on the environment. As you know that’s super important to us at Vurger! They’ve introduced their own water bottles and a refilling station. While you can still purchase plastic water bottles (while their stocks last) they cost a hefty £2- but don’t worry- a whopping £1 of each sale goes towards The Ocean Clean-Up Project. Awesome. 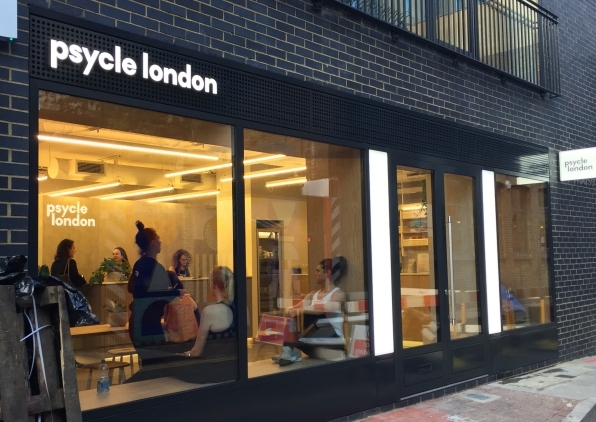 They have also ousted plastic clothing bags from the changing rooms, encouraging you to bring your own or purchase a reusable one from the front desk. Like us, all of their drinks containers are made from compostable materials. Yes guys! Sinead was our instructor for the 55 minute session. She was super helpful in correcting our postures and keeping us motivated when we needed it. And boy did we need it! It burned. A lot. Over the course of the session we used resistance bands, medicine balls and small hand weights. The class itself was divided fairly evenly between the barre, freestanding resistance exercises, and mat work. The exercises were extremely dynamic and there was lots of variation which kept things interesting. On the website they say that this class is ‘made to target the muscles in the thighs, bum, arms and core to the point of fatigue for a serious, results based workout’. They weren’t lying. It’s the most our muscles have ever wobbled during a workout class- barre or other. Unlike many other traditional barre workouts, it’s set to loud pumping music which drives you through the session and makes for a faster paced workout than other more conventional classes. Think of barre on speed. It had a little less focus on the actual ballet positions than other barre classes- but the core principals were still there- and the day after we really felt the difference! In summary- This class is NOT for the faint hearted- but if you want to see visible results in a matter of a few sessions then you’re in the right place. The amount of people turning up to an 8:15am session is a testament to its popularity. 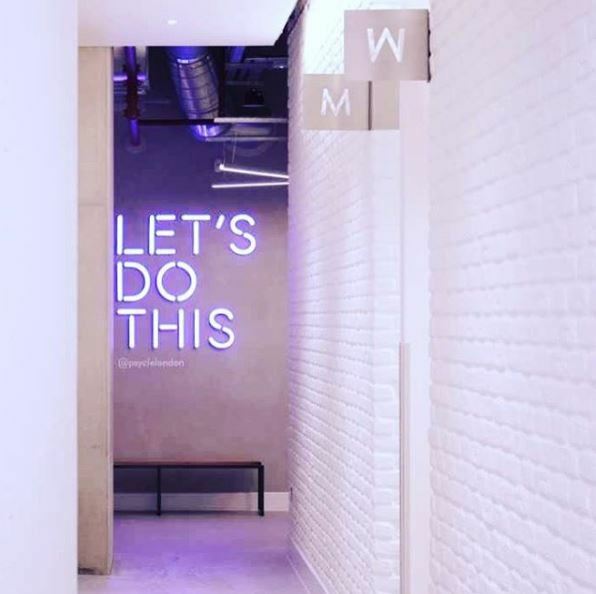 Combined with the mega swish surroundings and the super friendly staff, Psycle definitely earns its place in our top 3 favourite boutique gyms in London!